The Second Vatican Council described Aquinas' system as the "Perennial Philosophy". Thomas Aquinas believed that truth is to be accepted no matter where it is found. His doctrines draw from Greek, Roman, and Jewish, philosophers. Specifically, he was a realist (i.e., he, unlike the skeptics, believed that the world can be known as it is). He largely followed Aristotelian terminology and metaphysics, and wrote comprehensive commentaries on Aristotle, often affirming Aristotle's views with independent arguments. Aquinas respectfully referred to Aristotle simply as "the Philosopher". He also adhered to some neoplatonic principles, for example that "it is absolutely true that there is first something which is essentially being and essentially good, which we call God, ... [and that] everything can be called good and a being, inasmuch as it participates in it by way of a certain assimilation..."
With the decree Postquam sanctissimus of 27 July 1914, Pope Pius X declared that 24 theses formulated by "teachers from various institutions ... clearly contain the principles and more important thoughts" of Aquinas. Principal contributors to the Church's official statement of the "24 Theses" of Thomism include Dominican philosopher and theologian Edouard Hugon of the Pontifical University of Saint Thomas Aquinas, Angelicum and Jesuit philosopher theologian Guido Mattiussi of the Pontifical Gregorian University. The principle of individuation, i.e., of numerical distinction of one individual from another with the same specific nature, is matter designated by quantity. Thus in pure spirits there cannot be more than one individual in the same specific nature. This rational soul is united to the body in such a manner that it is the only substantial form of the body. By virtue of his soul a man is a man, an animal, a living thing, a body, a substance and a being. Therefore, the soul gives man every essential degree of perfection; moreover, it gives the body a share in the act of being whereby it itself exists. Aquinas says that the fundamental axioms of ontology are the principle of non-contradiction and the principle of causality. Therefore, any being that does not contradict these two laws could theoretically exist, even if said being were incorporeal. Aquinas noted three forms of descriptive language when predicating: univocal, analogical, and equivocal. Equivocation is the complete change in meaning of the descriptor and is an informal fallacy. For example, when the word "bank" is applied to river banks and financial banks, modern philosophers talk of ambiguity. Further, the usage of "definition" that Aquinas gives is the genus of the being, plus a difference that sets it apart from the genus itself. For instance, the Aristotelian definition of "man" is "rational animal"; its genus being animal, and what sets apart man from other animals is his rationality. —  De Principiis Naturæ, 1. Being is divided in two ways: that which is in itself (substances), and that which is in another (accidents). Substances are things which exist per se or in their own right. Accidents are qualities that apply to other things, such as shape or color: "[A]ccidents must include in their definition a subject which is outside their genus." Because they only exist in other things, Aquinas holds that metaphysics is primarily the study of substances, as they are the primary mode of being. The Catholic Encyclopedia pinpoints Aquinas' definition of quiddity as "that which is expressed by its definition." The quiddity or form of a thing is what makes the object what it is: "[T]hrough the form, which is the actuality of matter, matter becomes something actual and something individual," and also, "the form causes matter to be." Thus, it consists of two parts: "prime matter" (matter without form), and substantial form, which is what causes a substance to have its characteristics. For instance, an animal can be said to be a being whose matter is its body, and whose soul is its substantial form. Together, these consist of its quiddity/essence. In one sense the term cause means (a) that from which, as something intrinsic, a thing comes to be, as the bronze of a statue and the silver of a goblet, and the genera of these. In another sense it means (b) the form and pattern of a thing, i.e., the intelligible expression of the quiddity and its genera (for example, the ratio of 2: 1 and number in general are the cause of an octave chord) and the parts which are included in the intelligible expression. Again, (c) that from which the first beginning of change or of rest comes is a cause; for example, an adviser is a cause, and a father is the cause of a child, and in general a maker is a cause of the thing made, and a changer a cause of the thing changed. Further, a thing is a cause (d) inasmuch as it is an end, i.e., that for the sake of which something is done; for example, health is the cause of walking. For if we are asked why someone took a walk, we answer, "in order to be healthy"; and in saying this we think we have given the cause. And whatever occurs on the way to the end under the motion of something else is also a cause. For example, reducing, purging, drugs and instruments are causes of health; for all of these exist for the sake of the end, although they differ from each other inasmuch as some are instruments and others are processes. —  Summa, II-I, Q.1, art.4. Thus, both Aristotle and Aquinas conclude that there must be an uncaused Primary Mover, because an infinite regress is impossible. However, the First Cause does not necessarily have to be temporally the first. Thus, the question of whether or not the universe can be imagined as eternal was fiercely debated in the Middle Ages. The University of Paris's condemnation of 1270 denounced the belief that the world is eternal. Aquinas' intellectual rival, Bonaventure, held that the temporality of the universe is demonstrable by reason. Aquinas' position was that the temporality of the world is an article of faith, and not demonstrable by reason; though one could reasonably conclude either that the universe is temporal or eternal. As per the Nicomachean Ethics of Aristotle, Aquinas defines "the good" as what all things strive for. E.g., a cutting knife is said to be good if it is effective at its function, cutting. As all things have a function/final cause, all real things are good. Consequently, evil is nothing but privatio boni, or "lack of good", as Augustine of Hippo defined it. —  Summa, I, Q.48, art.1. Commentating on the aforementioned, Aquinas says that "there is no problem from the fact that some men desire evil. For they desire evil only under the aspect of good, that is, insofar as they think it good. Hence their intention primarily aims at the good and only incidentally touches on the evil." As God is the ultimate end of all things, God is by essence goodness itself. Furthermore, since love is "to wish the good of another," true love in Thomism is to lead another to God. Hence why John the Evangelist says, "Whoever is without love does not know God, for God is love." —  Summa, I, Q.2, art.2. Aquinas responds to the problem of evil by saying that God allows evil to exist that good may come of it, (for goodness done out of free will is superior than goodness done from biological imperative) but does not personally cause evil Himself. Aquinas articulated and defended, both as a philosopher and a theologian, the orthodox Christian view of God. God is the sole being whose existence is the same as His essence: "what subsists in God is His existence." (Hence why God names himself "I Am that I Am" in Exodus 3:14.) Consequently, God cannot be a body (that is, He cannot be composed of matter), He cannot have any accidents, and He must be simple (that is, not separated into parts; the Trinity is one substance in three persons). Further, He is goodness itself, perfect, infinite, omnipotent, omniscient, happiness itself, knowledge itself, love itself, omnipresent, immutable, and eternal. Summing up these properties, Aquinas offers the term actus purus (Latin: "pure actuality"). Aquinas held that not only does God have knowledge of everything, but that God has "the most perfect knowledge," and that it is also true to say that God "is" His understanding. Aquinas was an advocate of the "analogical way", which says that because God is infinite, people can only speak of God by analogy, for some of the aspects of the divine nature are hidden (Deus absconditus) and others revealed (Deus revelatus) to finite human minds. Thomist philosophy holds that we can know about God through his creation (general revelation), but only in an analogous manner. For instance, we can speak of God's goodness only by understanding that goodness as applied to humans is similar to, but not identical with, the goodness of God. Further, he argues that sacred scripture employs figurative language: "Now it is natural to man to attain to intellectual truths through sensible objects, because all our knowledge originates from sense. Hence in Holy Writ, spiritual truths are fittingly taught under the likeness of material things." In order to demonstrate God's creative power, Aquinas says: "If a being participates, to a certain degree, in an 'accident,' this accidental property must have been communicated to it by a cause which possesses it essentially. Thus iron becomes incandescent by the action of fire. Now, God is His own power which subsists by itself. The being which subsists by itself is necessarily one." In addition to agreeing with the Aristotelian definition of man as "the rational animal," Aquinas also held various other beliefs about the substance of man. For instance, as the essence (nature) of all men are the same, and the definition of being is "an essence that exists," humans that are real therefore only differ by their specific qualities. More generally speaking, all beings of the same genus have the same essence, and so long as they exist, only differ by accidents and substantial form. —  Dubray, C. (1909). Faculties of the Soul. In The Catholic Encyclopedia. New York: Robert Appleton Company. Retrieved May 29, 2010 from New Advent. Aquinas affirms Aristotle's definition of happiness as "an operation according to perfect virtue", and that "happiness is called man's supreme good, because it is the attainment or enjoyment of the supreme good." Regarding what the virtues are, Aquinas ascertained the cardinal virtues to be prudence, temperance, justice, and fortitude. The cardinal virtues are natural and revealed in nature, and they are binding on everyone. There are, however, three theological virtues: faith, hope, and charity (which is used interchangeably with love in the sense of agape). These are supernatural and are distinct from other virtues in their object, namely, God. In accordance with Roman Catholic theology, Aquinas argues that humans can neither wish nor do good without divine grace. However, "doing good" here refers to doing good per se: man can do, moved by God even then but "only" in the sense in which even his nature depends on God's moving, things that happen to be good in some respect, and are not sinful, though if he has not grace, it will be without merit, and he will not succeed in it all the time. Therefore, happiness is attained through the perseverance of virtue given by the Grace of God, which is not fully attained on earth; only at the beatific vision. Notably, man cannot attain true happiness without God. Regarding emotion (used synonymously with the word "passion" in this context), which, following John Damascene, Aquinas defines as "a movement of the sensitive appetite when we imagine good or evil," Thomism repudiates both the Epicurean view that happiness consists in pleasure (sensual experiences that invoke positive emotion), and the Stoic view that emotions are vices by nature. Aquinas takes a moderate view of emotion, quoting Augustine: "They are evil if our love is evil; good if our love is good." While most emotions are morally neutral, some are inherently virtuous (e.g. pity) and some are inherently vicious (e.g. envy). Thomist ethics hold that it is necessary to observe both circumstances and intention to determine an action's moral value, and therefore Aquinas cannot be said to be strictly either a deontologicalist or a consequentialist. Rather, he would say that an action is morally good if it fulfills God's antecedent will. —  Summa, II-II, Q.40, art.1. Eternal law, which is "the type of Divine Wisdom, as directing all actions and movements;"
Divine law, which are moral imperatives specifically given through revelation. The development of natural law is one of the most influential parts of Thomist philosophy. Aquinas says that "[the law of nature] is nothing other than the light of the intellect planted in us by God, by which we know what should be done and what should be avoided. God gave this light and this law in creation... For no one is ignorant that what he would not like to be done to himself he should not do to others, and similar norms." This reflects Paul the Apostle's argument in Romans 2:15, that the "work of the law [is] written in [the Gentiles'] hearts, their conscience bearing witness to them." Aquinas argues that the Mosaic covenant was divine, though rightfully only given to the Jews before Christ; whereas the New Covenant replaces the Old Covenant and is meant for all humans. —  Summa, I., Q.83, art.1. Whatever is in our intellect must have previously been in the senses. —  Thomas Aquinas, the peripatetic axiom. Aquinas adhered to the correspondence theory of truth, which says that something is true "when it conforms to the external reality." Therefore, any being that exists can be said to be true insofar that it participates in the world. Aquinas' epistemological theory would later be classified as empiricism, for holding that sensations are a necessary step in acquiring knowledge, and that deductions cannot be made from pure reason. Aquinas shifted Scholasticism away from neoplatonism and towards Aristotle. The ensuing school of thought, through its influence on Catholicism and the ethics of the Catholic school, is one of the most influential philosophies of all time, also significant due to the number of people living by its teachings. Before Aquinas' death, Stephen Tempier, Bishop of Paris, forbade certain positions associated with Aquinas (especially his denial of both universal hylomorphism and a plurality of substantial forms in a single substance) to be taught in the Faculty of Arts at Paris. 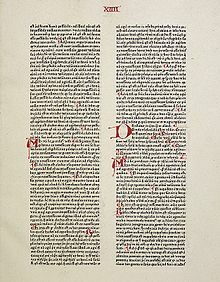 Through the influence of traditional Augustinian theologians, some theses of Aquinas were condemned in 1277 by the ecclesiastical authorities of Paris and Oxford (the most important theological schools in the Middle Ages). The Franciscan Order opposed the ideas of the Dominican Aquinas, while the Dominicans institutionally took up the defense of his work (1286), and thereafter adopted it as an official philosophy of the order to be taught in their studia. Early opponents of Aquinas include William de la Mare, Henry of Ghent, Giles of Rome, and Jon Duns Scotus. The modern period brought considerable difficulty for Thomism. By the 19th century, Aquinas's theological doctrine was often presented in seminaries through his Jesuit manualist interpreters, who adopted his theology in an eclectic way, while his philosophy was often neglected altogether in favor of modern philosophers. Many think the manualist approach had more in common with Duns Scotus than it did with Aquinas—thus is more properly labeled Neo-Scholasticism. And in all this, the Dominican Order, was having demographic difficulties. Pope Leo XIII attempted a Thomistic revival, particularly with his 1879 encyclical Aeterni Patris and his establishment of the Leonine Commission, established to produce critical editions of Aquinas' opera omnia. This encyclical served as the impetus for the rise of Neothomism, which brought an emphasis on the ethical parts of Thomism, as well as a large part of its views on life, humans, and theology, are found in the various schools of Neothomism. Neothomism held sway as the dominant philosophy of the Roman Catholic Church until the Second Vatican Council, which seemed to confirm the significance of Ressourcement theology. Thomism remains a school of philosophy today, and influential in Catholicism, though "The Church has no philosophy of her own nor does she canonize any one particular philosophy in preference to others." Aquinas' doctrines, because of their close relationship with those of Jewish philosophy, found great favor among Jews. Judah Romano (born 1286) translated Aquinas' ideas from Latin into Hebrew under the title Ma'amar ha-Mamschalim, together with other small treatises extracted from the "Contra Gentiles" ("Neged ha-Umot"). Aquinas did not disdain to draw upon Jewish philosophical sources. His main work, the Summa Theologica, shows a profound knowledge not only of the writings of Avicebron (Ibn Gabirol), whose name he mentions, but also of most Jewish philosophical works then existing. Aquinas pronounces himself energetically against the hypothesis of the eternity of the world, in agreement with both Christian and Jewish theology. But as this theory is attributed to Aristotle, he seeks to demonstrate that the latter did not express himself categorically on this subject. "The argument," said he, "which Aristotle presents to support this thesis is not properly called a demonstration, but is only a reply to the theories of those ancients who supposed that this world had a beginning and who gave only impossible proofs. There are three reasons for believing that Aristotle himself attached only a relative value to this reasoning..." In this, Aquinas paraphrases Maimonides' Guide for the Perplexed, where those reasons are given. —  Meditations on First Philosophy, Med. II, §13. Since the modern world began in the sixteenth century, nobody's system of philosophy has really corresponded to everybody's sense of reality; to what, if left to themselves, common men would call common sense. Each started with a paradox; a peculiar point of view demanding the sacrifice of what they would call a sane point of view. That is the one thing common to Hobbes and Hegel, to Kant and Bergson, to Berkeley and William James. A man had to believe something that no normal man would believe, if it were suddenly propounded to his simplicity; as that law is above right, or right is outside reason, or things are only as we think them, or everything is relative to a reality that is not there. The modern philosopher claims, like a sort of confidence man, that if we will grant him this, the rest will be easy; he will straighten out the world, if he is allowed to give this one twist to the mind... Against all this the philosophy of St. Thomas stands founded on the universal common conviction that eggs are eggs. The Hegelian may say that an egg is really a hen, because it is a part of an endless process of Becoming; the Berkelian may hold that poached eggs only exist as a dream exists, since it is quite as easy to call the dream the cause of the eggs as the eggs the cause of the dream; the Pragmatist may believe that we get the best out of scrambled eggs by forgetting that they ever were eggs, and only remembering the scramble. But no pupil of St. Thomas needs to addle his brains in order adequately to addle his eggs; to put his head at any peculiar angle in looking at eggs, or squinting at eggs, or winking the other eye in order to see a new simplification of eggs. The Thomist stands in the broad daylight of the brotherhood of men, in their common consciousness that eggs are not hens or dreams or mere practical assumptions; but things attested by the Authority of the Senses, which is from God. —  Chesterton, St. Thomas Aquinas, p. 147. An idea of the longstanding historic continuity of Dominican Thomism may be derived from the list of people associated with the Pontifical University of St. Thomas Aquinas. Outside the Dominican Order Thomism has had varying fortunes leading some to periodize it historically or thematically. Weisheipl distinguishes "wide" Thomism, which includes those who claim to follow the spirit and basic insights of Aquinas and manifest an evident dependence on his texts, from "eclectic" Thomism which includes those with a willingness to allow the influence of other philosophical and theological systems in order to relativize the principles and conclusions of traditional Thomism. John Haldane gives an historic division of Thomism including 1) the period of Aquinas and his first followers from the 13th to 15th centuries, a second Thomism from the 16th to 18th centuries, and a Neo-Thomism from the 19th to 20th centuries. One might justifiably articulate other historical divisions on the basis of shifts in perspective on Aquinas' work including the period immediately following Aquinas' canonization in 1325, the period following the Council of Trent, and the period after the Second Vatican Council. Romanus Cessario thinks it better not to identify intervals of time or periods within the larger history of Thomism because Thomists have addressed such a broad variety of issues and in too many geographical areas to permit such divisions. 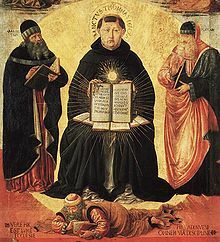 The first period of Thomism stretches from Aquinas' teaching activity beginning in 1256 at Paris to Cologne, Orvieto, Viterbo, Rome, and Naples until his canonization in 1325. In this period his doctrines "were both attacked and defended" as for example after his death (1274) the condemnations of 1277, 1284 and 1286 were counteracted by the General Chapters of the Dominican Order and other disciples who came to Aquinas' defense. The Thomist revival that began in the mid-19th century, sometimes called "neo-scholasticism" or "neo-Thomism," can be traced to figures such as Angelicum professor Tommaso Maria Zigliara, Jesuits Josef Kleutgen, and Giovanni Maria Cornoldi, and secular priest Gaetano Sanseverino. This movement received impetus from Pope Leo XIII's encyclical Aeterni Patris of 1879. Generally the revival accepts the interpretative tradition of Aquinas' great commentators such as Capréolus, Cajetan, and John of St. Thomas. Its focus, however, is less exegetical and more concerned with carrying out the program of deploying a rigorously worked out system of Thomistic metaphysics in a wholesale critique of modern philosophy. Other seminal figures in the early part of the century include Martin Grabmann (1875-1949) and Amato Masnovo (1880-1955). The movement's core philosophical commitments are summarized in "Twenty-Four Thomistic Theses" approved by Pope Pius X. In the first half of the twentieth century Angelicum professors Edouard Hugon, Réginald Garrigou-Lagrange among others, carried on Leo's call for a Thomist revival. Their approach is reflected in many of the manuals and textbooks widely in use in Roman Catholic colleges and seminaries before Vatican II. A summary of some recent and current schools and interpretations of Thomism can be found, among other places, in La Metafisica di san Tommaso d'Aquino e i suoi interpreti (2002), by Battista Mondin, Being and Some 20th Century Thomists (2003), by John F. X. Knasas as well as in the writing of Edward Feser. Neo-Scholastic Thomism identifies with the philosophical and theological tradition stretching back to the time of St. Thomas. In the nineteenth century authors such as Tommaso Maria Zigliara focused not only on exegesis of the historical Aquinas but also on the articulation of a rigorous system of orthodox Thomism to be used as an instrument of critique of contemporary thought. Due to its suspicion of attempts to harmonize Aquinas with non-Thomistic categories and assumptions, Neo-Scholastic Thomism has sometimes been called "strict observance Thomism." A discussion of recent and current Neo-Scholastic Thomism can be found in La Metafisica di san Tommaso d'Aquino e i suoi interpreti (2002) by Battista Mondin, which includes such figures as Martin Grabmann, Reginald Garrigou-Lagrange, Sofia Vanni Rovighi (1908–1990), Cornelio Fabro (1911–1995), Carlo Giacon (1900–1984), Tomáš Týn (1950–1990), Abelardo Lobato (1925–2012), Leo Elders (b. 1926) and Giovanni Ventimiglia (b. 1964) among others. Fabro in particular emphasizes Aquinas' originality, especially with respect to the actus essendi or act of existence of finite beings by participating in being itself. Other scholars such as those involved with the "Progetto Tommaso" seek to establish an objective and universal reading of Aquinas' texts. Cracow Circle Thomism (named after Cracow) has been called "the most significant expression of Catholic thought between the two World Wars." The Circle was founded by a group of philosophers and theologians that in distinction to more traditional Neo-Scholastic Thomism embraced modern formal logic as an analytical tool for traditional Thomist philosophy and theology. Inspired by the logical clarity of Aquinas, members of the Circle held both philosophy and theology to contain "propositions with truth-values…a structured body of propositions connected in meaning and subject matter, and linked by logical relations of compatibility and incompatibility, entailment etc." "The Cracow Circle set about investigating and where possible improving this logical structure with the most advanced logical tools available at the time, namely those of modern mathematical logic, then called 'logistic'." Perhaps the most famous exponent of the Cracow Circle is Józef Maria Bocheński, author of A History of Formal Logic (1961), and one of the preeminent twentieth-century historians of logic. Bocheński completed a doctorate in theology at the Pontifical University of Saint Thomas Aquinas, Angelicum in 1934 where he taught logic until 1940. Other members included Jan Salamucha and Jan F. Drewnowski. Étienne Gilson (1884–1978), the key proponent of existential Thomism, tended to emphasize the importance of historical exegesis but also to deemphasize Aquinas's continuity with the Aristotelian tradition, and like Cornelio Fabro of the Neo-scholastic school, to highlight the originality of Aquinas's doctrine of being as existence. He was also critical of the Neo-Scholastics' focus on the tradition of the commentators, and given what he regarded as their insufficient emphasis on being or existence accused them of "essentialism" (to allude to the other half of Aquinas's distinction between being and essence). Gilson's reading of Aquinas as putting forward a distinctively "Christian philosophy" tended, at least in the view of his critics, to blur Aquinas's distinction between philosophy and theology. Jacques Maritain (1882–1973) introduced into Thomistic metaphysics the notion that philosophical reflection begins with an "intuition of being," and in ethics and social philosophy sought to harmonize Thomism with personalism and pluralistic democracy. Though "existential Thomism" was sometimes presented as a counterpoint to modern existentialism, the main reason for the label is the emphasis this approach puts on Aquinas's doctrine of existence. Contemporary proponents include Joseph Owens and John F. X. Knasas. Unlike the first three schools mentioned above, transcendental Thomism, associated with Joseph Maréchal (1878–1944), Karl Rahner (1904–84), and Bernard Lonergan (1904–84), does not oppose modern philosophy wholesale, but seeks to reconcile Thomism with a Cartesian subject-centered approach to knowledge in general, and Kantian transcendental philosophy in particular. It seems fair to say that most Thomists otherwise tolerant of diverse approaches to Aquinas's thought tend to regard transcendental Thomism as having conceded too much to modern philosophy genuinely to count as a variety of Thomism, strictly speaking, and this school of thought has in any event been far more influential among theologians than among philosophers. Lublin Thomism, which derives its name from the Catholic University of Lublin in Poland where it is centered, is also sometimes called "phenomenological Thomism." Like transcendental Thomism, it seeks to combine Thomism with certain elements of modern philosophy. In particular, it seeks to make use of the phenomenological method of philosophical analysis associated with Edmund Husserl and the ethical personalism of writers like Max Scheler in articulating the Thomist conception of the human person. Its best-known proponent is Karol Wojtyla (1920–2005), who went on to become Pope John Paul II. Analytical Thomism described by John Haldane, its key proponent, as "a broad philosophical approach that brings into mutual relationship the styles and preoccupations of recent English-speaking philosophy and the concepts and concerns shared by Aquinas and his followers" (from the article on "analytical Thomism" in The Oxford Companion to Philosophy, edited by Ted Honderich). By "recent English-speaking philosophy" Haldane means the analytical tradition founded by thinkers like Gottlob Frege, Bertrand Russell, G. E. Moore, and Ludwig Wittgenstein, which tends to dominate academic philosophy in the English-speaking world. Elizabeth Anscombe (1919–2001) and her husband Peter Geach are sometimes considered the first "analytical Thomists," though (like most writers to whom this label has been applied) they did not describe themselves in these terms, and as Haldane's somewhat vague expression "mutual relationship" indicates, there does not seem to be any set of doctrines held in common by all analytical Thomists. What they do have in common seems to be that they are philosophers trained in the analytic tradition who happen to be interested in Aquinas in some way; and the character of their "analytical Thomism" is determined by whether it tends to stress the "analytical" side of analytical Thomism, or the "Thomism" side, or, alternatively, attempts to emphasize both sides equally. In his Against Henry, King of the English, Luther criticized the use of the proof by assertion and a reliance on style over substance in the Thomist form of disputation, which he alleged as being, "It seems so to me. I think so. I believe so." Luther also argued that the Thomist method led to shallow among theological debates in England at the time. In 1967, Thomism was criticized by Bertrand Russell. Besides this, neo-scholasticism in general, including Thomism, is criticized by some Catholics. ^ Pope Pius X, Doctoris Angelici, 29 June 1914. ^ E.g., Summa Theologiæ, Q.84, art.7. Archived 29 October 2009 at the Wayback Machine, where the sed contra is only a quote from Aristotle's De anima. ^ "Summa, I, Q.6, art.4". Newadvent.org. Archived from the original on 4 December 2011. Retrieved 20 November 2011. See also P. Lumbreras's commentary on the 24 Thomistic Theses Archived 5 June 2011 at the Wayback Machine. ^ De Ente et Essentia, 67–68. Archived 26 November 2009 at the Wayback Machine "Although everyone admits the simplicity of the First Cause, some try to introduce a composition of matter and form in the intelligences and in souls... But this is not in agreement with what philosophers commonly say, because they call them substances separated from matter, and prove them to be without all matter." ^ "Summa contra Gentiles, II, chp. 91". Op-stjoseph.org. Archived from the original on 28 February 2009. Retrieved 20 November 2011. ^ Sproul, R.C. (1998). Renewing Your Mind: Basic Christian Beliefs You Need to Know. Grand Rapids, MI: Baker Books. p. 33. ISBN 978-0-8010-5815-8. ^ a b "De Ente et Essentia, 37". Op-stjoseph.org. Archived from the original on 26 November 2009. Retrieved 20 November 2011. ^ De Ente et Essentia, 83. Archived 26 November 2009 at the Wayback Machine "And this is why substances of this sort are said by some to be composed of "that by which it is" and "that which is," or as Boethius says, of "that which is" and "existence."" ^ a b Summa, I, Q.3, art.4. Archived 9 November 2011 at the Wayback Machine "Therefore, if the existence of a thing differs from its essence, this existence must be caused either by some exterior agent or by its essential principles." ^ "De Ente et Essentia, 17". Op-stjoseph.org. Archived from the original on 26 November 2009. Retrieved 20 November 2011. ^ "De Ente et Essentia, 110". Op-stjoseph.org. Archived from the original on 26 November 2009. Retrieved 20 November 2011. "And because accidents are not composed of matter and form, their genus cannot be taken from matter and their difference from form, as in the case of composed substances." ^ "Aveling, Francis. "Essence and Existence." The Catholic Encyclopedia. Vol. 5. New York: Robert Appleton Company, 1909. 4 Nov. 2009". Newadvent.org. 1 May 1909. Archived from the original on 11 October 2011. Retrieved 20 November 2011. ^ "De Ente et Essentia, 18". Op-stjoseph.org. Archived from the original on 26 November 2009. Retrieved 20 November 2011. ^ Summa, I, Q.75, art.5. Archived 19 January 2012 at the Wayback Machine The meaning of this sentence can be altered depending on how the Latin word used in this sentence, "materiæ", is translated into English. An alternate rendering of this sentence is "The form causes matter to be what it is. ^ "De Ente et Essentia, 40". Dhspriory.org. Archived from the original on 19 December 2011. Retrieved 20 November 2011. ^ "De Ente et Essentia, 14". Op-stjoseph.org. Archived from the original on 26 November 2009. Retrieved 20 November 2011. ^ De Principiis Naturæ, 5. Archived 16 September 2009 at the Wayback Machine "But, just as everything which is in potency can be called matter, so also everything from which something has existence whether that existence be substantial or accidental, can be called form; for example man, since he is white in potency, becomes actually white through whiteness, and sperm, since it is man in potency, becomes actually man through the soul." ^ "De veritate, Q.1". Op-stjoseph.org. Archived from the original on 24 April 2009. Retrieved 20 November 2011. ^ a b c "Summa, I, Q.44, art.1". Newadvent.org. Archived from the original on 5 November 2011. Retrieved 20 November 2011. ^ "St. Thomas Aquinas's commentary on the Metaphysics, Bk. V, 1015a 20-1015b 15, §840". Dhspriory.org. Archived from the original on 19 November 2011. Retrieved 20 November 2011. ^ "St. Thomas Aquinas's commentary on the Metaphysics, Bk. II, 994a 11-994b 9". Dhspriory.org. Archived from the original on 27 November 2011. Retrieved 20 November 2011. ^ "Summa contra Gentiles, II, chp.15". dhspriory.org. Archived from the original on 3 September 2010. ^ Summa, I, Q.2, art.3. Archived 28 April 2013 at the Wayback Machine "The third way is taken from possibility and necessity, and runs thus..."
^ "Summa, II-I, Q.1, art.4". Newadvent.org. Archived from the original on 5 November 2011. Retrieved 20 November 2011. ^ Br. Bugnolo, Alexis, trans., Opera Omnia S. Bonaventurae (Franciscan Archives, 2007), 22. [permanent dead link] "It must be said, that to posit, that the world is eternal and (has) not (been) eternally produced, by positing that all things (have been) produced out of nothing, is entirely contrary to the truth and to reason." ^ "Summa, I, Q.46, art.2". Newadvent.org. Archived from the original on 9 November 2011. Retrieved 20 November 2011. ^ "De aeternitate mundi". Dhspriory.org. Archived from the original on 4 December 2011. Retrieved 20 November 2011. ^ "Nicomachean Ethics, Bk. I, Chp. I, 1094a4". Dhspriory.org. Archived from the original on 1 October 2011. Retrieved 20 November 2011. ^ "St. Thomas Aquinas's commentary on the Nicomachean Ethics, Bk. I, Lec. I, §10". Dhspriory.org. Archived from the original on 1 October 2011. Retrieved 20 November 2011. ^ "Summa Contra Gentiles, III, Q.18". Dhspriory.org. Archived from the original on 7 October 2011. Retrieved 20 November 2011. ^ a b "Summa, I., Q.6., art.2 & 3". Newadvent.org. Archived from the original on 4 December 2011. Retrieved 20 November 2011. ^ "Summa, II-I, Q.26, art.4". Newadvent.org. Archived from the original on 9 November 2011. Retrieved 20 November 2011. ^ "1 John 4:8". Usccb.org. 13 March 2011. Archived from the original on 31 July 2011. Retrieved 20 November 2011. ^ a b "Summa, I, Q.20, art.1". Newadvent.org. Archived from the original on 15 November 2011. Retrieved 20 November 2011. ^ "Summa, I, Q.2". Newadvent.org. Archived from the original on 28 April 2013. Retrieved 20 November 2011. ^ Aquinas offers more metaphysical explanations for the existence of God in De Ente et Essentia Archived 26 November 2009 at the Wayback Machine and elsewhere, though the Quinquae viae are the most well-known and most commonly analyzed among these. ^ Summa Contra Gentiles, Bk. III, Q.10. Archived 7 October 2011 at the Wayback Machine "Thus, it is... that evil is only caused by good accidentally." ^ "Summa, I, Q.49, art.2". Newadvent.org. Archived from the original on 9 November 2011. Retrieved 20 November 2011. ^ "Summa, I, Q.3, art.4". Newadvent.org. Archived from the original on 9 November 2011. Retrieved 20 November 2011. ^ "Summa, I, Q.13, art.11". Newadvent.org. Archived from the original on 20 November 2011. Retrieved 20 November 2011. ^ "Summa, I, Q.13, art. 1". Newadvent.org. Archived from the original on 9 November 2011. Retrieved 20 November 2011. ^ "Summa, I, Q.13, art. 6". Newadvent.org. Archived from the original on 9 November 2011. Retrieved 20 November 2011. ^ "Summa, I, Q.13, art. 7". Newadvent.org. Archived from the original on 9 November 2011. Retrieved 20 November 2011. ^ "Summa, I., Q.4". Newadvent.org. Archived from the original on 9 November 2011. Retrieved 20 November 2011. ^ "Summa, I., Q.7". Newadvent.org. Archived from the original on 9 November 2011. Retrieved 20 November 2011. ^ "Summa, I., Q.25, art.3". Newadvent.org. Archived from the original on 21 November 2011. Retrieved 20 November 2011. ^ a b "Summa, I, Q.14, arts. 5, 6, & 9". Newadvent.org. Archived from the original on 9 November 2011. Retrieved 20 November 2011. ^ a b Summa, II-I, Q.3, art.1. Archived 12 March 2013 at the Wayback Machine "God is happiness by His Essence." ^ a b "Summa, I, Q.14, art. 4". Newadvent.org. Archived from the original on 9 November 2011. Retrieved 20 November 2011. ^ "Summa, I., Q.8". Newadvent.org. Archived from the original on 9 November 2011. Retrieved 20 November 2011. ^ "Summa, I., Q.9". Newadvent.org. Archived from the original on 9 November 2011. Retrieved 20 November 2011. ^ "Summa, I., Q.10, art.2". Newadvent.org. Archived from the original on 28 November 2011. Retrieved 20 November 2011. ^ Summa contra Gentiles, Bk. I, chp. 30. Archived 28 February 2009 at the Wayback Machine "For we cannot grasp what God is, but only what He is not and how other things are related to Him, as is clear from what we said above." ^ "Summa, I, Q.1, art.9". Newadvent.org. Archived from the original on 23 November 2011. Retrieved 20 November 2011. ^ De Ente et Essentia, 24. Archived 26 November 2009 at the Wayback Machine "It is clear, therefore, that the essence of man and the essence of Socrates do not differ, except as the non-designated from the designated. Whence the Commentator says in his considerations on the seventh book of the Metaphysics that "Socrates is nothing other than animality and rationality, which are his quiddity."" ^ De Ente et Essentia, 33. Archived 26 November 2009 at the Wayback Machine "The difference, on the contrary, is a name taken from a determinate form, and taken in a determinate way, i.e. as not including a determinate matter in its meaning. This is clear, for example, when we say animated, i.e., that which has a soul; for what it is, whether a body or something other, is not expressed. Whence Ibn Sīnā says that the genus is not understood in the difference as a part of its essence, but only as something outside its essence, as the subject also is understood in its properties. And this is why the genus is not predicated essentially of the difference, as the Philosopher says in the third book of the Metaphysics and in the fourth book of the Topics, but only in the way in which a subject is predicated of its property." ^ St. Thomas Aquinas's commentary on De anima, Bk. I, 402a1–403b2, §1. Archived 4 April 2010 at the Wayback Machine "Now living beings taken all together form a certain class of being; hence in studying them the first thing to do is to consider what living things have in common, and afterwards what each has peculiar to itself. What they have in common is a life-principle or soul; in this they are all alike. In conveying knowledge, therefore, about living things one must first convey it about the soul as that which is common to them all. Thus when Aristotle sets out to treat of living things, he begins with the soul; after which, in subsequent books, he defines the properties of particular living beings." ^ "Summa, I, Q.75, art.6". Newadvent.org. Archived from the original on 19 January 2012. Retrieved 20 November 2011. ^ "Summa, II-I, Q.3, art.2". Newadvent.org. Archived from the original on 9 January 2012. Retrieved 20 November 2011. ^ St. Thomas Aquinas's commentary on Nicomachean Ethics, Lec. 10, §130. Archived 24 September 2015 at the Wayback Machine Aquinas further says that "it is clear that happiness is a virtue-oriented activity proper to man in a complete life." ^ "Summa, II-I, Q.3, art.1". Newadvent.org. Archived from the original on 9 January 2012. Retrieved 20 November 2011. ^ "Summa, II-I, Q.62, art.2". Newadvent.org. Archived from the original on 9 November 2011. Retrieved 20 November 2011. ^ "Summa, II-I, Q.109, art.2". Newadvent.org. Archived from the original on 13 November 2011. Retrieved 20 November 2011. ^ "Summa, II-I, Q. 109, art.10". Newadvent.org. Archived from the original on 13 November 2011. Retrieved 20 November 2011. ^ Summa, II-I, Q.5, art.3. Archived 21 October 2012 at the Wayback Machine "First, from the general notion of happiness. For since happiness is a "perfect and sufficient good," it excludes every evil, and fulfils every desire. But in this life every evil cannot be excluded." ^ Summa, II-I, Q.5, art.1. Archived 21 October 2012 at the Wayback Machine "Happiness is the attainment of the Perfect Good... And therefore man can attain Happiness. This can be proved again from the fact that man is capable of seeing God, [which] man's perfect Happiness consists." ^ "Summa, supp., Q.93, art.1". Newadvent.org. Archived from the original on 15 November 2011. Retrieved 20 November 2011. ^ "Summa, II-I, Q.5, art.5". Newadvent.org. Archived from the original on 9 November 2011. Retrieved 20 November 2011. ^ "Summa, II-I, Q.22, art.3". Newadvent.org. Archived from the original on 9 November 2011. Retrieved 20 November 2011. ^ "Summa, II-I, Q.34., art.2". Newadvent.org. Archived from the original on 28 November 2011. Retrieved 20 November 2011. ^ "Summa, II-I, Q.2, art.6". Newadvent.org. Archived from the original on 4 December 2011. Retrieved 20 November 2011. ^ "Summa, II-I, Q.24, art.2". Newadvent.org. Archived from the original on 9 November 2011. Retrieved 20 November 2011. ^ "Summa, II-I, Q.24, art.1". Newadvent.org. Archived from the original on 9 November 2011. Retrieved 20 November 2011. ^ "Summa, II-I, Q.24, art.4". Newadvent.org. Archived from the original on 9 November 2011. Retrieved 20 November 2011. ^ "Summa, II-II, Q.36". Newadvent.org. Archived from the original on 10 November 2011. Retrieved 20 November 2011. ^ "Summa, II-I, Q.18, art.3 & 10". Newadvent.org. Archived from the original on 10 November 2011. Retrieved 20 November 2011. ^ "Summa, II-I, Q.19, art.1 & 2". Newadvent.org. Archived from the original on 3 November 2011. Retrieved 20 November 2011. ^ "De veritate, Q. 23, art.7". Op-stjoseph.org. Archived from the original on 3 May 2009. Retrieved 20 November 2011. ^ "Summa, II-I, Q.90, art.4". Newadvent.org. Archived from the original on 2 November 2011. Retrieved 20 November 2011. ^ "Summa, II-I, Q.93, art. 1". Newadvent.org. Archived from the original on 9 November 2011. Retrieved 20 November 2011. ^ "Summa, II-I, Q.95, art.1". Newadvent.org. Archived from the original on 9 November 2011. Retrieved 20 November 2011. ^ Summa, II-I, Q.91, art.4. Archived 4 July 2007 at the Wayback Machine "By the natural law the eternal law is participated proportionately to the capacity of human nature. But to his supernatural end man needs to be directed in a yet higher way. Hence the additional law given by God, whereby man shares more perfectly in the eternal law." ^ "St. Thomas Aquinas's commentary on the Ten Commandments, prologue, sec. 'A fourfold law'". Op-stjoseph.org. Archived from the original on 15 September 2009. Retrieved 20 November 2011. ^ "Summa, II-I, Q.98, art.1 & 4–5". Newadvent.org. Archived from the original on 9 November 2011. Retrieved 20 November 2011. ^ "Summa, II-I, Q.107, art.2". Newadvent.org. Archived from the original on 9 November 2011. Retrieved 20 November 2011. ^ "Summa, II-I, Q.106, art.4". Newadvent.org. Archived from the original on 7 May 2017. Retrieved 20 November 2011. ^ "De veritate, Q.2, art.3, answer 19". Op-stjoseph.org. Archived from the original on 3 May 2009. Retrieved 20 November 2011. ^ "De veritate, Q. 1, art. 3". Op-stjoseph.org. Archived from the original on 24 April 2009. Retrieved 20 November 2011. ^ "Summa, I, Q.16, art.6". Newadvent.org. Archived from the original on 6 January 2012. Retrieved 20 November 2011. ^ "De anima, Bk. II, Chp. V, 417b18–418a25". Op-stjoseph.org. Archived from the original on 7 January 2010. Retrieved 20 November 2011. ^ "Summa, I, Q.84, art.1". Newadvent.org. Archived from the original on 2 November 2011. Retrieved 20 November 2011. ^ "Summa, I, Q.84, art.7". Newadvent.org. Archived from the original on 2 November 2011. Retrieved 20 November 2011. ^ "St. Thomas Aquinas's commentary on De anima, §688". Op-stjoseph.org. Archived from the original on 7 January 2010. Retrieved 20 November 2011. ^ "Summa, I, Q.84, art.8". Newadvent.org. Archived from the original on 2 November 2011. Retrieved 20 November 2011. ^ a b Kennedy, Daniel (1912). "Thomism" . In Herbermann, Charles (ed.). Catholic Encyclopedia. 14. New York: Robert Appleton Company. "Gradually, however, during the seventeenth and eighteenth centuries, there came a decline in the study of the works of the great Scholastics." ^ John Paul II. "Fides et ratio, 49". Vatican.va. Archived from the original on 26 November 2011. Retrieved 20 November 2011. ^ "Summa, I, Q.3, art. 7". Newadvent.org. Archived from the original on 9 November 2011. Retrieved 20 November 2011. ^ "Summa, I, Q.46., art.1". Newadvent.org. Archived from the original on 22 February 2007. Retrieved 20 November 2011. ^ "Archived copy". Archived from the original on 27 September 2013. Retrieved 21 August 2013. CS1 maint: Archived copy as title (link) “The Revival of Thomism: An Historical Survey, ” James Weisheipl, 1962. ^ Frederick J. Roensch (1 January 1964). Early Thomistic school. Priory Press. ^ Sharon M. Leon (5 June 2013). An Image of God: The Catholic Struggle with Eugenics. University of Chicago Press. pp. 21–. ISBN 978-0-226-03898-8. ^ Feser, Edward (15 October 2009). "The Thomistic tradition (Part 1)". Archived from the original on 29 November 2010. Retrieved 2 January 2011. ^ e.g., Thomas Aquinas (1952), edd., Walter Farrell, OP, STM, and Martin J. Healy, STD, My Way of Life: Pocket Edition of St. Thomas—The Summa Simplified for Everyone, Brooklyn, NY: Confraternity of the Precious Blood. ^ Gilson wrote about the topic of faith and reason in a chapter of his book Le Thomisme Archived 5 June 2011 at the Wayback Machine. ^ "The natural sciences are epistemologically first. Archived 5 June 2011 at the Wayback Machine" contains an excerpt from Benedict Ashley (2006). The Way toward Wisdom: An Interdisciplinary and Contextual Introduction to Metaphysics. Houston: University of Notre Dame Press for the Center of Thomistic Studies. OCLC 609421317. Archived from the original on 4 April 2009. comparing this chief thesis of River Forest Thomism to the objections from Lawrence Dewan, O.P. ^ Biography "Archived copy". Archived from the original on 14 May 2018. Retrieved 23 February 2018. CS1 maint: Archived copy as title (link) . ^ There is a River Forest Dominican Collection at the Jacques Maritain Center, at the University of Notre Dame. http://www3.nd.edu/Departments/Maritain/rf.htm[permanent dead link] . Accessed 2015 January 14. Benedict Ashley (2006). The Way toward Wisdom: An Interdisciplinary and Contextual Introduction to Metaphysics. Houston: University of Notre Dame Press for the Center of Thomistic Studies. OCLC 609421317. Archived from the original on 4 April 2009. ^ "A Brief Overview of Lublin Thomism". Hyoomik.com. Archived from the original on 10 March 2012. Retrieved 20 November 2011. ^ Edward Feser (18 October 2009). "The Thomistic tradition, Part II". Archived from the original on 29 November 2010. Retrieved 2 January 2011. ^ The introduction Archived 26 May 2011 at the Wayback Machine to Paterson & Pugh's book on Analytical Thomism Archived 4 April 2016 at the Wayback Machine is available gratis online.